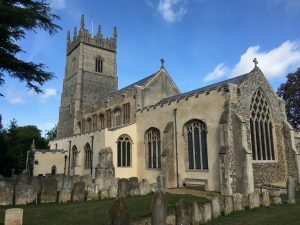 Welcome to the C13th church of St Andrew’s, situated in the heart of the village of Northwold, in Norfolk. St Andrew’s Church is one of five churches in the Benefice of Grimshoe, which comprises: St Mary’s Feltwell, St James’ Hockwold, St Mary’s Weeting, St Mary’s Southery and St Andrew’s Northwold. The church is central to the attractive village of Northwold and its community, where not only religious, but many other events, take place. The only Grade I listed building in the village, it has stood for around 800 years and is noted for its beautiful chalk Easter Sepulchre. The village is mentioned in the Domesday Book as Nortwalde, part of the Hundred of Grimshoe. For more information about the Easter Sepulchre and to read about the fascinating history of St Andrew’s Church, please see the Church Guide.